A blog can be an extremely useful tool. Not only are they essential in a good SEO strategy, blogs can help you becoming an authority in your field. However, it is not easy becoming a niche leader by posting a few blogs. Just like SEO strategies, you require a blogging strategy to make the most out of your blogs. The following tips can help you formulate a blogging strategy so that you become an expert in your chosen niche. You need to provide authoritative content to your readers. Your content can only be authoritative if you have conducted a thorough research into the topic and it provides some value to the readers. Your readers should be benefitted in some way through the articles. Research is crucial when you are trying to become an expert. There are two reasons why people read blogs. They read because either the blog is entertaining or they are gaining something they require. If your blogs fall into one of these categories, then your readers are bound to be interested. Entertain them with your blogs or ensure that they get something valuable in return for reading. You can always quote comments or statistics by the leaders in your industry or niche. However, you need to avoid repeating what they said all the time. Your readers can get such information directly from the leaders and specialists. In order to attract readers, you need to provide your own insight into the matter. Expert bloggers write about the current events and developments in their chosen field or niche. You need to keep track of the news that relate to your niche and blog about them. A fresh development can affect the industries and customers of your niche. By blogging about them as soon as possible, your readers will be kept informed. This is a type of value that will be admired by your readers. The easiest way to lose your readership is being inconsistent on your blog posts. You should stick to a schedule when posting your blogs. This helps the readers to understand when they can expect the next blog from you. If you are inconsistent, your readers are going to look for other blogs that can provide them with information they need. A comments section in your blog will be useful in more ways than one. Comments left behind by readers can give ideas and inspiration for new blogs. You can even get ideas to improve the effectiveness of your blog based on the feedback received by readers. You need the help of other experts in order to become an expert yourself. Connect your blogs to other experts by means of links and comments. Your readers will feel as if you are an expert. At the same time, they will also get to know to the opinions of the other industry experts which will be beneficial for them. 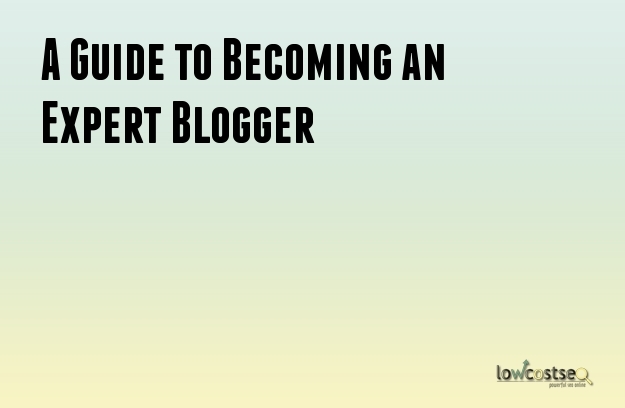 Becoming an expert blogger in your niche is not a very difficult thing to do. You simply need to put in enough effort.